Since the first release of Defining Creativity in March 2014 I have been giving lectures about creativity around the world. In my talks I cover many different aspects of creativity, using examples from both the arts and sciences. 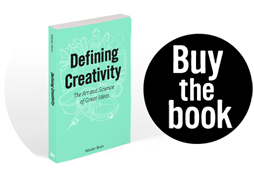 I explain how creativity starts with imagination, how it’s a combination of existing elements and how it’s always based on knowledge. I further discuss how each domain has its own technical and cultural rules and experts who decide whether new ideas are allowed to enter. And I also talk about problem solving, the importance of social interaction, personalities that enhance creativity, how creative insights work and the importance of the unconscious brain. I am a guest lecturer at the University of the Arts Utrecht, and gave lectures at the University of Amsterdam and at NYU and Columbia University in New York. In 2015 I spoke at TEDxBostonUniversity. In New York I also spoke the Dutch Consulate General and at different creative agencies, among which DDB, Anomaly, Sid Lee, Translation and McGarry Bowen. In Shanghai I spoke at BBH, Wieden+Kennedy and Ogilvy One and in Singapore at the Raffles Design Institute, Ngee Ann Polytechnic, JFDI and The Hub. I also do customized talks about certain aspects of creativity. For example, I talked about ‘Failure’ at Creative Mornings, about what Amsterdam should do to remain a creative capital for VNO/NCW Metropole Amsterdam and about how companies should adapt to a changing environment at the Persgroep’s Advertiser’s Summit in Manchester in 2016. If you would like to invite me to talk about creativity, send me an email. You can also book me through the Speaker’s Academy.